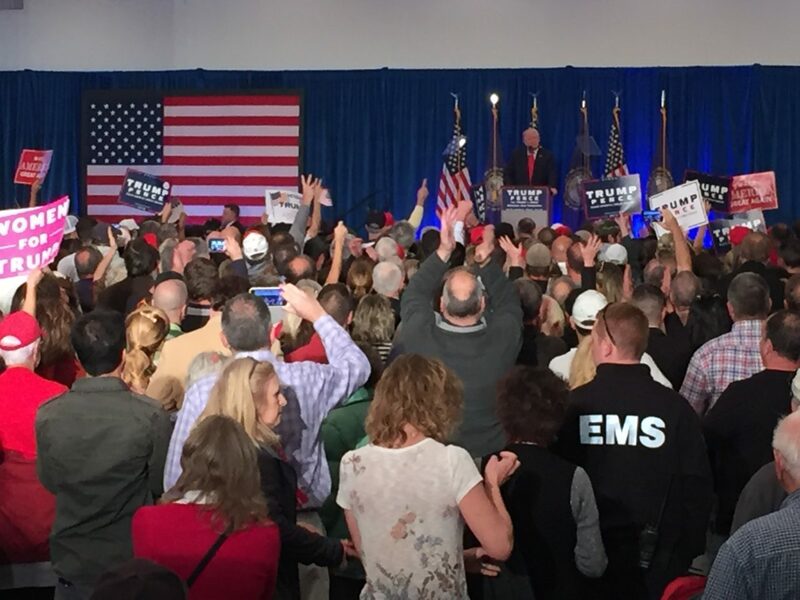 ATKINSON, New Hampshire — Republican nominee Donald Trump kicked off his final push for the presidency on Friday in New Hampshire, where a packed audience of about 1,000 gathered to hear their candidate at the Atkinson Country Club. Trump cited a new CBS News story revealing that some of the State Department emails, among the 650,000 found by the FBI on Anthony Weiner’s laptop, were not previously seen by authorities. And America, he said, was tired of Clinton crises. And he pledged to “drain the swamp” of corruption in Washington. Trump cited Friday’s October unemployment report, noting that 425,000 people had left the labor force. He slammed NAFTA and the awarding of Most Favored Nation status to China, both of which occurred during President Bill Clinton’s administration, blaming them for the loss of one in four manufacturing jobs. He recalled his victory in the primary. The newspapers, he said, had written: “It looks like trump could lose New Hampshire.” He won in a “landslide,” he recalled. 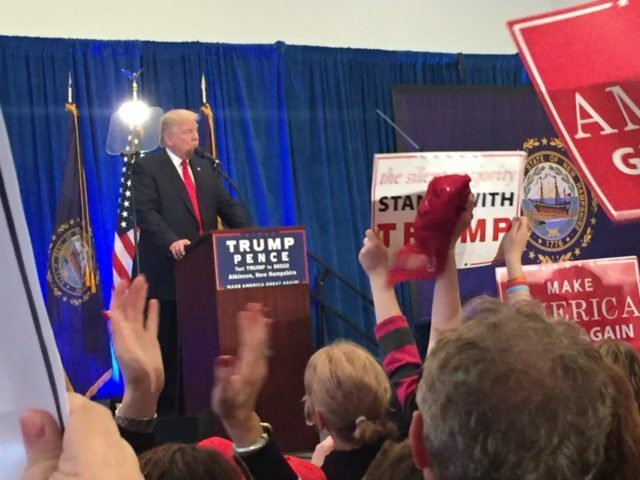 Trump then spoke about heroin and drug addiction, speaking of the impact the stories of New Hampshire residents had on him. He departed from the prepared text on the TelePrompTer as he spoke about those stories — which he has often mentioned at other stops on the campaign trail, in other states. Trump joked that the press would focus on that remark. 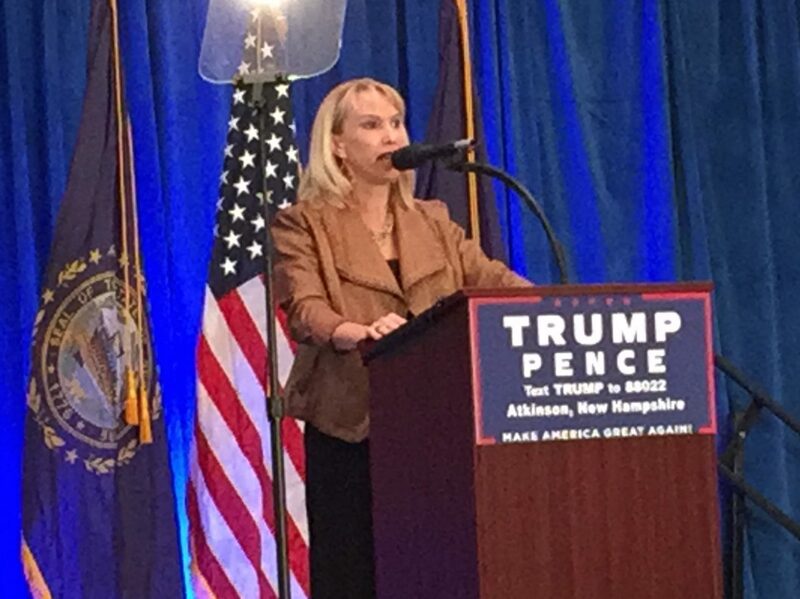 Before Trump spoke, Kate Quigley, sister of Benghazi hero Glen Doherty, addressed the audience, who listened to her story in rapt, and even tearful, silence. She spoke about how Hillary Clinton had told her family that a YouTube video was responsible for the attack, and how the only person at the memorial who told the truth to her about the attack was the Libyan ambassador to the U.S.
Kathleen Healey-Tilton of Salem, New Hampshire, told Breitbart News that she expected Trump to win the state, not only because he is leading in recent polls, but because “some people will not answer survey questions,” and because voters in general were fed up with both parties. After Quigley, Former Sen. Bob Smith (R-NH) warmed up the audience, entertaining them with a dead-on impression of Bill Clinton endorsing Trump. 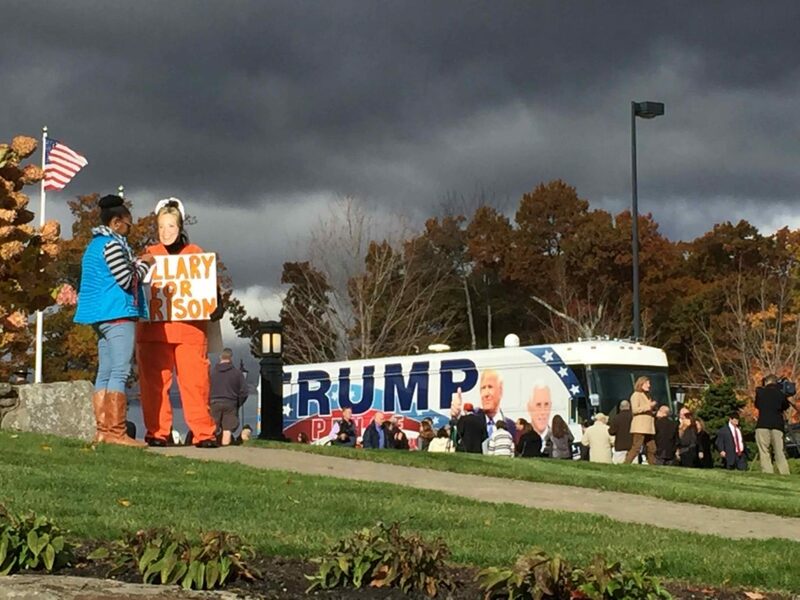 “If Hillary goes to prison, I’ll be free as a bird!” he laughed. 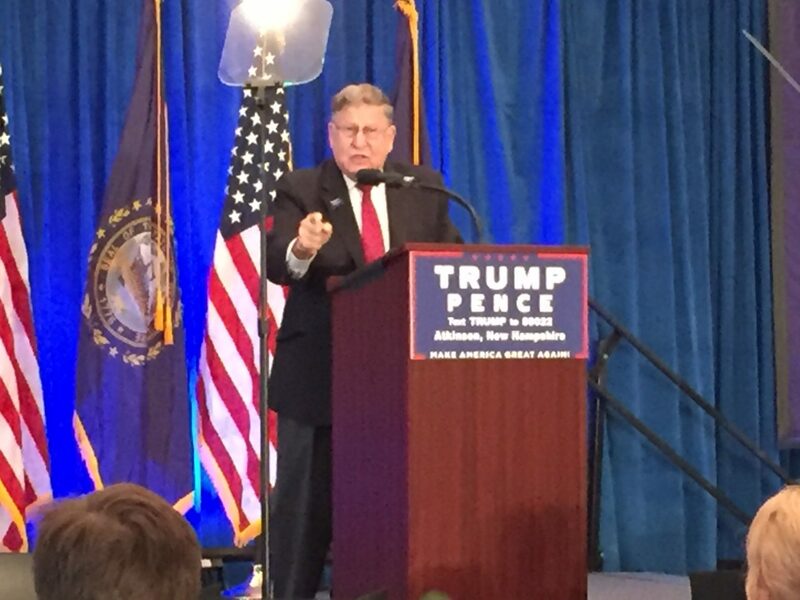 Next was former governor John Sununu, who addressed the Trump rally last week in Manchester just before the FBI’s decision to re-open the investigation into Hillary Clinton became known. Sununu, a member of the Bush family circle and a prominent surrogate for Mitt Romney in 2012, also explained why he became a Trump supporter after opposing him. As some chanted, “Lock her up,” one man shouted: “Execute her.” Sununu interrupted his remarks to rebuke the man, who protested: “For treason.” Sununu repeated his rebuke, and continued with his speech. Hillary Clinton “will continue the Obama-inspired slide to socialism,” Sununu said. Mike, from Sandown, called the election “the most important in my lifetime.” He said he was hopeful Trump would win, since he had more votes than anyone in the history of the New Hampshire primary. Steve Lewis, of Rochester, said the most important issue for him was the state of Veterans Affairs (VA) hospitals. “The VA is worse than it’s ever been,” he said. A string of recent polls has Trump tied with, or slightly ahead of, Clinton in the Granite State. The Trump campaign will visit several more states Friday, ahead of a busy travel and campaign weekend.